comScore: Facebook Passes Yahoo To Become The Second Largest Video Site In The U.S.
Unsurprisingly, YouTube.com took the stop spot in terms of viewers, with 146.3 million unique viewers. Facebook.com jumped one position to capture the #2 spot with 58.6 million viewers, for a total of 243 million viewing sessions, continuing on its growth in video viewership and surpassing Yahoo. Yahoo came in third with 53.9 million viewers, followed by VEVO with 45.4 million. 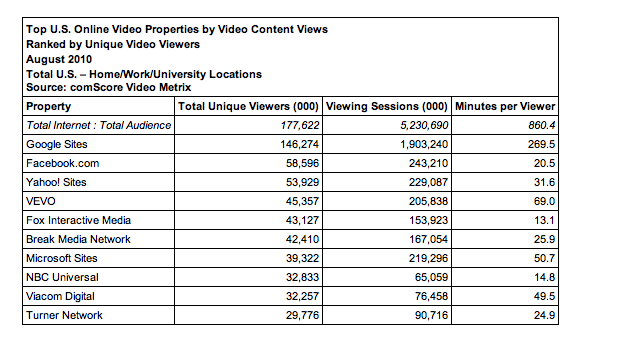 Google Sites in total had the highest number of overall viewing sessions with 1.9 billion and average time spent per viewer at 270 minutes, or 4.5 hours. Americans viewed more than 3.8 billion video ads in August, up from 3.6 billion July. Hulu generated the highest number of video ad impressions at 790 million, followed by BrightRoll Video Network with 469 million ad views. Video ads reached 45 percent of the total U.S. population an average of 28 times during the month. Hulu delivered the highest frequency of video ads to its viewers with an average of 30 over the course of the month. The top video ad networks in terms of their potential reach of the total U.S. population were: Break Media at 46.4 percent, BrightRoll Video Network at 45.0 percent, and ScanScout Network at 44.5 percent (Hulu isn’t included in this because it is not a standalone video ad network). The average duration of the average online content video was 4.8 minutes, while the average online video ad was 0.4 minutes. And video ads accounted for 10.7 percent of all videos viewed and 1.0 percent of all minutes spent viewing video online. It’s no secret that Facebook’s video viewership and content is growing by leaps and bounds. And it’s pretty impressive that the social network has more viewers online than content and media sites like NBC, Fox and Turner.